By now I’m sure you will have heard the phrase “content is king”. Although the phrase has now become, somewhat cliche it is still largely true. Well-written, targeted and engaging content can really make your small business stand out from the crowd and entice new and past customers to work with you. That’s why it’s crucial that you carefully plan your blog, social media and printed publication content. Not only will it save you time in the long-run but also improve the creativity and effectiveness of all your various social platforms, increase your efficiency, engagement and boost your SEO which means the potential for more customers and therefore more purchases. Is this piece of content engaging? What type of content receives the most engagement from my customers? When does my content receive the most engagement? Does my audience respond best the text, image or video content? This information can then be used to inform later decisions and content choices for the upcoming months ensuring that your content is also effective and engaging. There are many different ways you can obtain this information. The first is by using tools such as Google Analytics which will show you how much engagement each blog post receives, and which are your most popular. For social media, systems like Buffer are great for not only analysing your data but for scheduling future content too. On the other hand, you can always collect the data manually by checking out each platform yourself. The content you include in your editorial calendar will vary depending on your business, customers and personal requirements. The same applies when choosing how you are going to organise and manage your editorial calendar and content. Keywords To Include – This one is important as including appropriate and accurate keywords lets search engines know how to rank you and your content so that you get relevant traffic. Sporting Events e.g. Olympics, local tournaments and competitions, championships and finals. An events calendar can be a really great tool to keep you on track with creating content that is relevant, topical, seasonal and varied. This is one of the easiest parts. With all the information you have collected about your audience and upcoming events you can now start planning your content! Here’s a little guide to help you, obviously this might not work for everyone as-is but hopefully it will give you an idea of where to start. Set a specific time to sit down and plan everything out. You could even get a friend or family member to help you out. Get a calendar and have it in front of you. This can either be a physical calendar or a digital version. Brainstorm, organise and plan your content covering the topics we mentioned above. Work methodically through the calendar, focusing on one month at a time. Try to fill out as much information as possible. Don’t worry if you change your mind just get it all in there, you can always rearrange at a later date. P.S. We would recommend posting at least once a fortnight as any less can result in customers forgetting to check in and your blog or social media looking stagnant. Once you have put everything in your editorial calendar you are ready to get your content out there. Remember to do an audit every month or couple of months to see which posts are out-performing others as well as have a little brainstorm at regular intervals to keep content flowing. 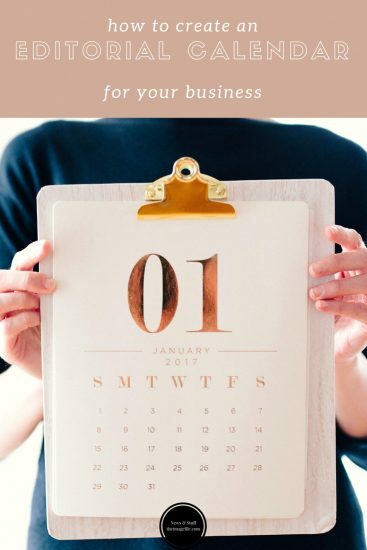 Also if you have employees or business partners that will need to be aware of your editorial calendar, remember to share it with them!